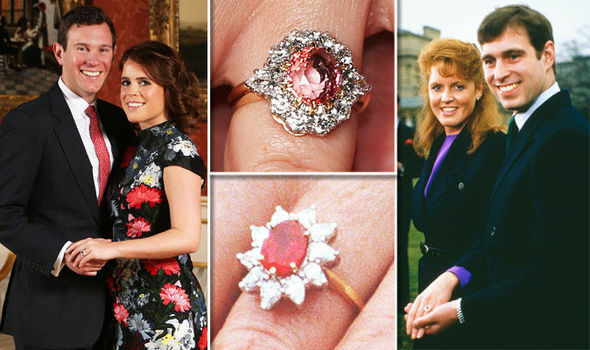 Royals: Princess Eugenie Gets Engaged! 2018 will be a rare “two royal wedding” year, and personally, I could not be more excited! On January 22, Buckingham Palace announced the engagement of Princess Eugenie of York to her longtime boyfriend Jack Brooksbank. They will marry this fall at St. George’s Chapel at Windsor Castle – the same location Harry and Meghan have chosen. Eugenie is one of Queen Elizabeth’s grandchildren, and the daughter of Prince Andrew and Sarah “Fergie” Ferguson, Duchess of York. She is eighth in the line of succession to the throne. Eugenie and Jack were introduced by friends while skiing in Switzerland. While Jack may be a “commoner”, he’s made a name for himself catering for the posh set in the hospitality industry. He spent some formative years as the manager of Mahiki nightclub, which was hugely popular among the young royal and celebrity set. He’s now a wine merchant and a brand ambassador of Casamigos Tequila, the company co-founded by George Clooney. They announced their engagement in the Picture Gallery at Buckingham Palace and released the following announcement. Unlike Meghan, who was somewhat chided for wearing a $75,000 Ralph and Russo gown, for her engagement shoot, Eugenie chose to recycle a lovely floral Erdem cocktail dress she’s owned for a few years. She chose a pair of black satin Jimmy Choo’s to complete the look. Her ring is rather unique, and bears a strong resemblance to her mothers engagement ring. It features a padparadscha sapphire, which despite it’s name, is actually a pink color, surrounded by a halo of diamonds. I had never heard of this type of sapphire before, but turns out it’s a rare pink-orange color and usually comes from Sri Lanka. Eugenie isn’t considered a “working royal”, though she serves as the patron of a handful of institutions and makes appearances at major family events. She currently works as a director at an art gallery in London. There’s a lot of chatter about who Eug will choose as her bridesmaids, since she runs in quite posh circles. Her older sister, Princess Beatrice will obviously serve as maid of honor, and she counts among her A-list friends singer Ellie Goulding (who coincidentally sang at Will and Kate’s wedding), it-girl and model Cara Delevingne, socialite Holly Branson (daughter of Richard) and (somewhat awkwardly) Cresisida Bonas, Harry’s ex-girlfriend! Congrats to Eug and Jack, and let’s all hope that whatever she chooses to wear for her big day, it’s better than what she wore for Will and Kate’s!